Could global warming cause thermal expansion of the Earth’s crust? In areas prone to seismic activity, this could cause submarine earthquakes and landslides. Such shockwaves could in turn disturb methane hydrates that are already more vulnerable due to temperature rises of the ocean. When large amounts of methane are abruptly released in shallow waters, there’s little opportunity for oxidation as the methane rises in the water, so the methane can enter the atmosphere largely unchanged, while hydroxyl depletion can extend methane’s lifetime in the atmosphere. Abrupt releases of large amounts of methane would dramatically accelerate local warming, necessitating geo-engineering. Note: This page was originally posted at knol in 2011 and, when knol was discontinued, preserved here for archival purposes. Earthquakes appear to be on the increase. The image below pictures the total strength of earthquakes with a magnitude of 6 or higher. Thermal expansion of the Earth's crust due to global warming can disturb submarine methane hydrates, which can result in the release of huge amount of methane. While in many cases the methane will be broken down in the water before it reaches the surface, in the shallows of the Arctic such releases could quickly enter the atmosphere, resulting in Runaway Warming. Are there indications that large methane releases are already taking place in the Arctic? If so, they would cause significant increases in temperature. One way to check this is by looking at temperature anomalies. The following image shows November 2010 temperature anomalies against base reference of 1951-1980. The above image is a screenshot from the NASA GISS November 2010 data. Missing data are replaced by the zonal mean to find that estimate. However, if the map only shows ocean data, the mean is computed only over the area with data (added 12/13/2010). The end points of the color bar are either -4.1 or +4.1 or the minimum or maximum value of the data if it is outside that range. 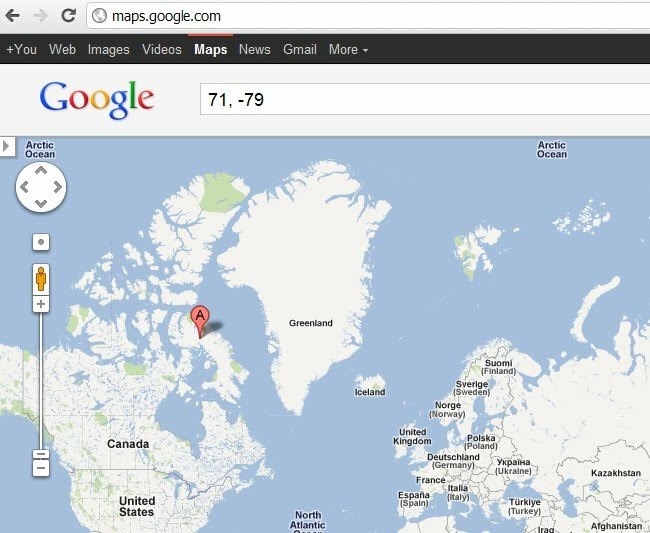 as shown on the screenshot below for latitude 71.00 and longitude -79.00, which are for Baffin Island in Canada. As discussed, temperature anomalies in the Arctic can be huge; they can exceed 10°C. For more recent temperature data, see the page at Arctic Temperature anomalies September 2011, which shows that 4°C and 5°C temperature anomalies in Arctic waters now commonly occur, e.g. in the Laptev Sea. The question is: How can such large temperature anomalies be explained? Furthermore, as the sea ice expands at the end of the summer season, a hole in the ice appears to form around an area in the Laptev Sea. It appears there is an area around which the sea ice forms later than the surrounding areas. Why is this the case? Could it be that methane is bubbling up in this area from the seabed? Katie Walter Anthony once observed that methane hotspots in lake beds can emit so much methane that the convection caused by bubbling can prevent all but a thin skin of ice forming above, leaving brittle openings the size of manhole covers even when the air temperature reaches -50 degrees C in the dark Siberian winter. This hole can be observed in October 2010 (animation top left) and end-October to early-November 2011 (animation bottom left), based onUniversity of Illinois data. This hole in the sea ice appears to be another anomaly, raising further questions as to why these anomalies occur in the Arctic. These anomalies cannot be explained through nitrous oxide emissions (even though they do occur increasingly in wetlands in the ESAS), since nitrous oxide is mostly released closer to the equator. Could soot and melting ice that combine to cause albedo change perhaps be responsible all this heat? Shindell, in a 2009 presentation, puts the RF of soot (black carbon) at 0.44 watts per square meter. 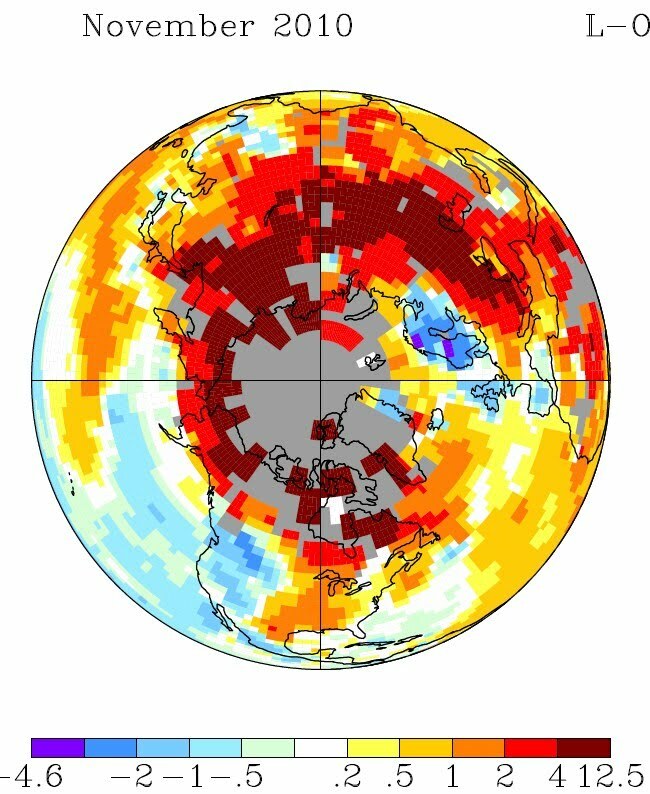 Albedo change is expected to add merely 0.3 watts per square meter over the entire land and water surface of the planet, says Stephen Hudson of the Norwegian Polar Institute, who bases his calculation on the Arctic having no ice for one month and decreased ice at all other times of the year. Most carbon dioxide does not originate in the Arctic, so this cannot explain the extreme temperature anomalies in the Arctic. While high levels of carbon dioxide do occur in the Arctic, the high initial Global Warming Potential (GWP) of methane make it a more likely candidate. Could it be that these temperature anomalies and this hole in the sea ice are all caused by warmer river water entering the Arctic? It could be, yet if that was the case, why then did this hole not form closer to the coast? Shindell gives methane (including indirect effects) a RF of about 1 Watt per square meter. This compares to 1.6 Watt per square meter for CO2, as well as 1.6 Watt per square meter for total net antropogenic forcing. Given its high initial GWP, methane could (at least partly) explain these Arctic anomalies. What type of methane is most likely to be behind these Arctic anomalies? Much methane originates from cows, rice fields, etc. In such cases, it does not originate in the Arctic, so this type of methane cannot explain anomalies in the Arctic as on the image right. Similarly, methane from wetlands and from transport of and drilling for natural gas would predominantly cause anomalies on land, rather than over the Arctic Ocean. Similarly, growth in concentrations of phytoplankton can hardly explain the prominence of methane in the Arctic. 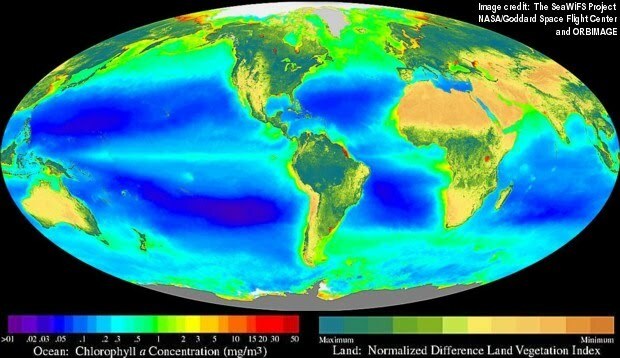 As the image below shows, concentrations of chlorophyll in the Atlantic Ocean in between Europe and Canada are similar to concentrations in open Arctic waters, yet methane on the image right is most prominent over the Arctic Ocean. Furthermore, phytoplankton is an unlikely candidate to explain the methane showing up on the image further below by Shakova and Semiletov, since phytoplankton would be much more likely to spread out over a wide area, instead of being so highly concentrated in a single point. 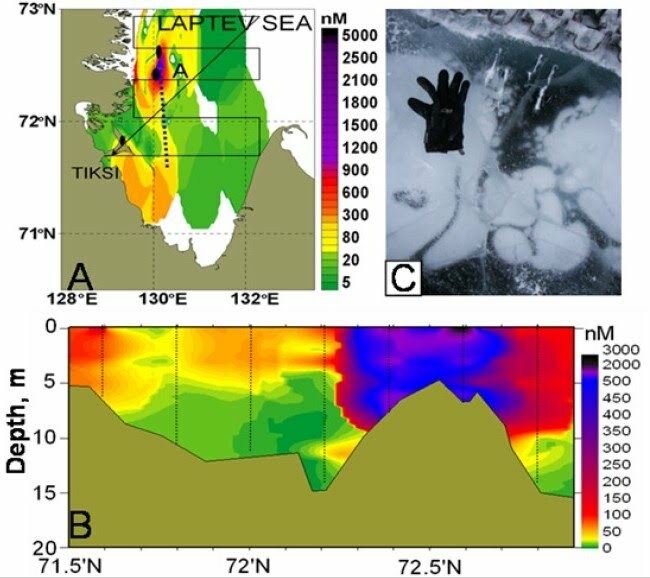 There are multiple lines of evidence indicating that methane is present in higher concentrations in the Arctic than elsewhere. 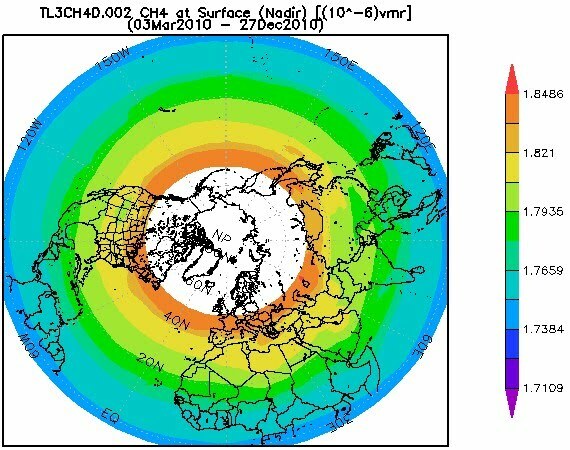 The images below are produced from the Giovanni NASA AIRS database at http://daac.gsfc.nasa.gov/giovanni/ showing 2006-2009 annual mean upper troposphere (359Hpa) measurements, from Giovanni NASA GES DISC showing surface measurements averaged over the period March 3, 2010, to December 27, 2010 and satellite measurements of methane at the north pole in April 2009. 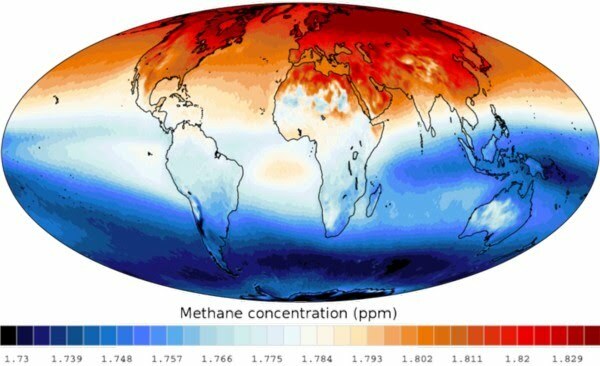 The NOAA image below further confirms that, the higher the latitude, the more prominent the presence of methane. 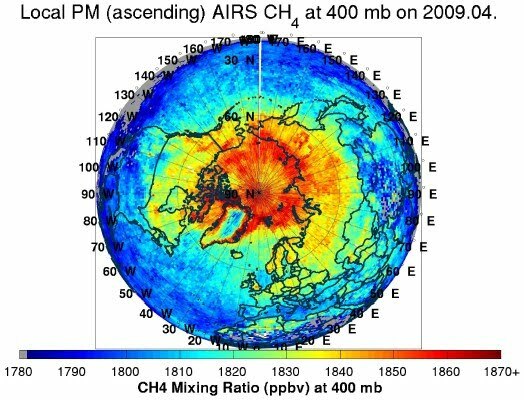 The HIPPO image left, based on data collected by airplane, also indicates that more methane is present in the Arctic than anywhere else on Earth, particularly at surface levels. 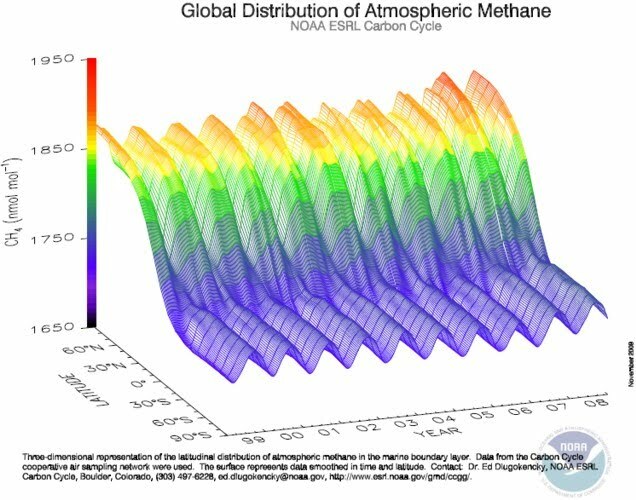 This suggests that methane is bubbling up, likely originating from submarine hydrates and is spreading over the globe as it reaches the stratosphere. In conclusion, methane from submarine hydrates is the most likely cause of temperature anomalies in the Arctic, in lack of alternative causes. 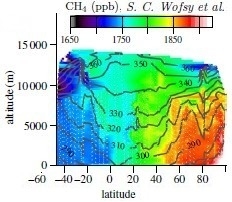 As said, the fact that methane is already bubbling up from submarine sediments is further supported by the image below, from Shakova, N. and Semiletov, I., Methane release from the East Siberian Arctic Shelf and the Potential for Abrupt Climate Change, Presentation, November 30, 2010. This post starts with the suggestion that global warming causes thermal expansion of the Earth's crust, which in turn causes seismic activity that can disturb methane hydrates and trigger large abrupt releases of methane in the Arctic. 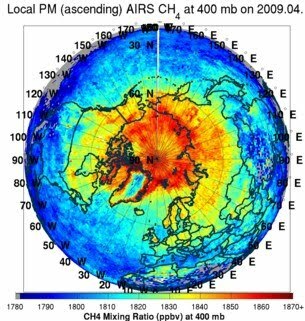 In the post Methane linked to seismic activity in the Arctic, methane emission points have been pinpointed with temperature as indicator, using the method described at the top of this page. As that post shows, the emission points thus found can be further compared with locations of seismic activity. A close match supports the suggestion that global warming is causing thermal expansion of the oceanic crust, putting stress on areas where tectonic plates meet, notably Gakkel Ridge in the Arctic. Seismic activity there in turn disturbs methane hydrates that are already more vulnerable due to temperature rises of the ocean. 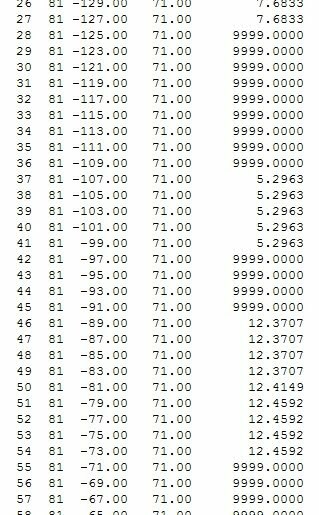 By subtracting the RF for all other factors causing the temperature anomalies, the effect of the methane emitted locally would remain. Applying the RF impact of methane (including its indirect effects) to that residual value would result in a value for the amount of methane being emitted within such an area. In a way, this suggestion does not hinge on findings of large releases of methane in the Arctic. Even if little or no methane was bubbling up, the danger would remain that this will occur in future. Furthermore, we're not looking for average temperature rises, such as in the case of gradual melting of hydrates in permafrost. Instead, we're looking for stress peaks that can trigger seismic activity that can in turn cause large abrupt releases of methane from collapsing hydrates. When conditions such as the ones below coincide, this danger can increase significantly. Deep oceans can warm by 18% to 19% more during a period corresponding with a La Niña event. http://www.nsf.gov/news/news_summ.jsp?cntn_id=121699 Such a warming peak deep in the ocean could put enough extra stress on these areas to trigger submarine seismic activity that in turn disturbs methane hydrates. Global warming heats up the Arctic Ocean. The shallows of the East Siberian Arctic Shelf (ESAS) will warm up fast in summer, when the sun hardly sets and now that the sea ice there has disappeared in summer. In the shallows of the ESAS, methane will have little opportunity to oxidize in the water, instead entering into the atmosphere rapidly after release. The Great Ocean Conveyor Belt brings warm water into the Arctic Ocean. As oceans heat up, warmer water will be moving into the Arctic, i.e. even warmer than before. Some of the heat may also translate into kinetic energy, speeding up oceans currents such as the Great Ocean Conveyor Belt, and thus pushing warmer water even stronger into the Arctic Ocean. 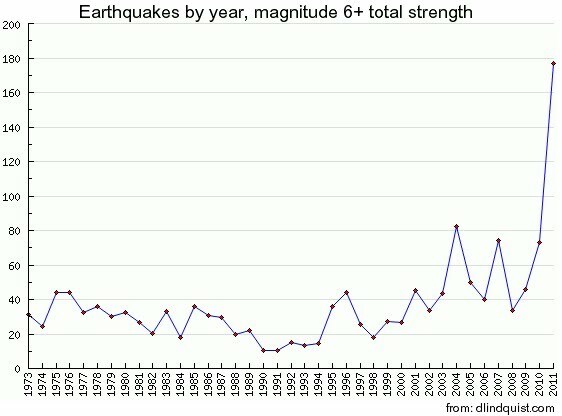 The frequency of mega earthquakes increases during periods when the sun has fewer sunspots and solar winds get stronger. Such conditions threaten to cause additional methane to be released in the Arctic Ocean, in turn causing additional local warming that accelerates local warming, in a vicious cycle that threatens to develop into runaway global warming. If further confirmed, the above line of evidence shows an unacceptable risk that methane releases can cause runaway global warming within decades. Even radically and abruptly stopping of all man-made emissions of greenhouse gases will not suffice to take away this risk, since previous emissions have already set Earth on a path of several degrees of warming that is still in the pipeline. Moreover, human activities are currently causing the release of huge amounts of aerosols into the atmosphere, partly masking the full impact of global warming. Therefore, cleaning up our act will have to be combined with the deliberate release of some aerosols and/or cloud brightening, for this masking effect to continue. Furthermore, afforestation, combined with adding soil supplements containing biochar and olivine sand, could bring carbon dioxide levels in the atmosphere back to 280 ppm within a century, while olivine dust could also reduce ocean acidification. Geo-engineering is an essential part of the solution, and the best of these technologies should be prepared, improved, implemented and further embraced as part of the necessary shift towards a sustainable economy.